Darjeeling: Rifleman Jiwan Gurung who was martyred in Kashmir was laid to rest with full military honours at Lower Lamahatta in Darjeeling. Thousands thronged to bid the brave heart a tearful farewell. Two explosions had taken place near Roopmati forward post in the Pukkharni area of Nowshera sector in Jammu and Kashmir's Rajouri district at 4:35 pm and 6:10 pm on Friday. The twin explosions killed Major Shashidharan V Nair (33) and Rifleman Jiwan Gurung (24) along with injuring several others. The IEDs are suspected to have been planted by militants from across the Line of Control. The 24-year-old Rifleman, Jiwan Gurung, hails from Lamahatta in Darjeeling. He had joined the Indian Army four years and 6 months ago. The news of his death was communicated to his family by the platoon commander of 2/1 Gorkha Regiment on Friday night. His mother Poonam Gurung went into a state of shock after hearing the news. His father Kiran Gurung is a government service holder in Arunachal Pradesh. Kiran Gurung was present to receive the body of his son at Bagdogra Airport on Saturday. "My son is a true hero of India. He has made the supreme sacrifice for the motherland," stated Kiran Gurung. Army top brass, Ex Servicemen, minister Goutam Deb; Administrative top brass including the District Magistrate of Darjeeling were present at Bagdogra Aiport on Saturday. "We mourn the death of the brave heart. The Chief Minister had called to pay homage on her behalf. It is indeed a very sad day for all of us," stated Goutam Deb. From Bagdogra, the mortal remains were taken to his native village Singritam, Lower Lamahatta, by road. 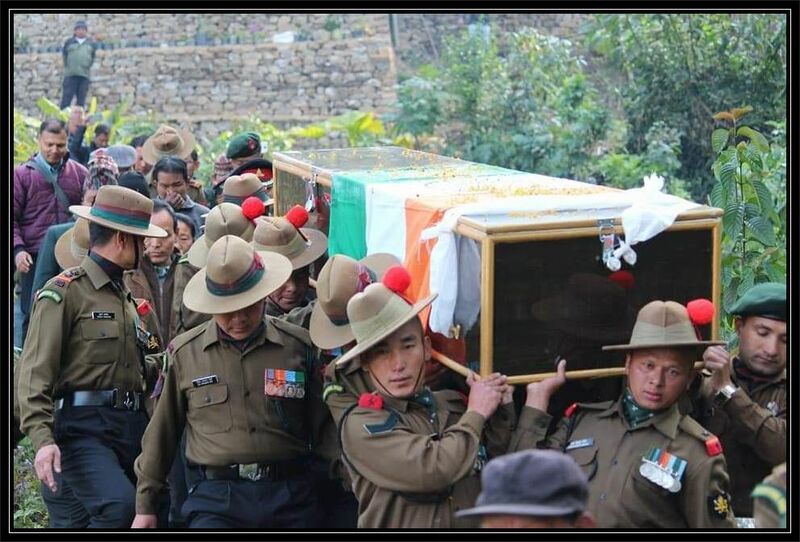 Rifleman Jiwan Gurung who was martyred in Kashmir was laid to rest with full military honours at Lower Lamahatta in Darjeeling. Thousands thronged to bid the brave heart a tearful farewell.